New York City is about as urban as urban gets, but even concrete jungles harbour leafy life. 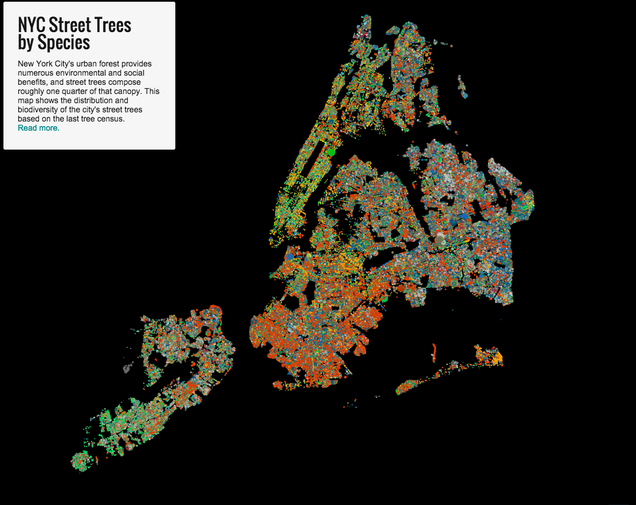 At last count, there were 592, 130 trees in the Big Apple, and thanks to the efforts of Brooklyn-based designer Jill Hubley, you can now study them all in a colourful interactive map. You can also get into as much detail as you like, by clicking on individual trees to learn their identity, zooming in to examine specific neighbourhoods and streets (seriously, if you ever wondered what sorts of trees line your block, give it a go! ), or using filters to look at the distribution of various species. I would’ve thought the trees throughout the city would be fairly homogeneous in terms of the percentages planted. Instead, Brooklyn has more London Plane trees than any other species (23.6%), Queens has a tonne of Norway maples (18.3%), the majority of Manhattan’s trees are Honey locusts (23.3%), and Staten Island has a high percentage of Callery pears (24.8%). The Bronx has the most evenly distributed assortment of trees—Honey locust, Norway maple, and London Plane tree are all popular (11-13% each). Images reproduced with permission from Jill Hubley. You can check out more of her awesome visualisations on her website.